VCs and the Feds Have Pumped Billions into Solar Start-Ups but Only a Few Will Survive. We Pick Some Potential Winners and Losers. The phenomenal promise of solar power technologies and markets has spurred venture firms to finance more than 250 new solar firms in the last few years. Each one of these 250 firms is looking for a 10% market share. 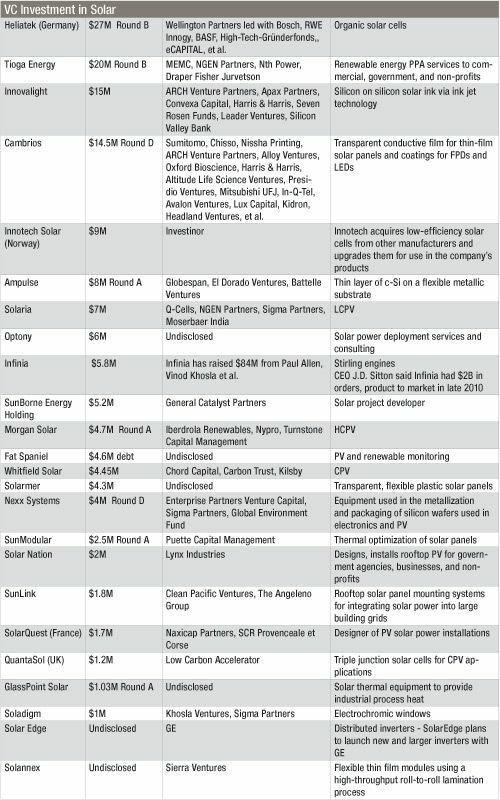 (We've listed most of these firms in the 150 Solar Start-Ups series - soon to be updated). VCs pumped $4.5 billion into greentech in 2009 and consistent with the last four years, solar power was once again the leading greentech investment segment at more than $1.4 billion in 84 deals. Now that the business plans have been launched and funding has taken place, is there a way to pick winners and losers from this pool of solar entrepreneurs? Only a few of these firms will survive - that's not cynicism, that's just VC start-up math. Which companies have a chance of bridging the innovator's chasm of death, winning customers, generating revenue and exiting via IPO or acqusition? Because being a revenue generating company is not enough for venture investors - there has to be an exit with big returns for the VC firm and the the firm's limited partners to consider the deal a success. Companies like Nanosolar and IPO-bound Solyndra have been at it for seven and five years respectively, have raised more than $1.2 billion dollars between the two of of them and have used every financial source available to fund their efforts - angel funding, venture capital, private equity, strategic funds, local and federal government grants and loans, etc. Both of these firms set forth on a wildly innovative technology path and have executed well on that technology. The proof of the pudding for these very different CIGS solar firms is going to be measured in their dollars per Watt and cost per Watt capex. And those numbers are still either unproven (Nanosolar) or currently way too high, in Solyndra's case. SunPower is the global efficiency leader in c-Si which results in lower levelized cost of energy, lower balance of plant costs, lower material costs and commands a price premium for that distinction. Start-up Suniva is following that path -- aiming for super-thin, 20% efficiency cells at an even lower cost than SunPower. Abound Solar is attempting to become "Second Solar" -- perhaps the trick to being a winning solar company is just picking the right absorber material. Forget CIGS and amorphous silicon, if First Solar can be the globe's leading solar company with Cadmium Telluride thin film on glass, then it's worth a try mimicking them. Abound has raised more than $100 million to attempt to design a CdTe manufacturing process more efficient than the one that First Solar has spent more than a decade refining. The idea of a power purchase agreement (PPA) for residential solar did not exist until start-ups like SunRun or SolarCity created these new businesses and markets. The innovative municipal financing concept of PACE (Property Assessed Clean Energy) did not exist as a business until Renewable Funding established and popularized it. The design architecture of each solar panel having its own inverter existed but was never fully realized until Enphase executed on the technology and business development to create a new class of solar inverters. Heated markets like solar tend to prompt investors to liberate technology from labs prematurely. The technology is not ready but the company has staffed up, dollared up, is burning cash and needs to continue to raise funds to develop their product. The hype cycle must continue despite the utter lack of technical progress or sales traction. One example of this dysfunctional corporate behavior is Konarka, ostensibly a manufacturer of polymer-based, organic photovoltaic cells. 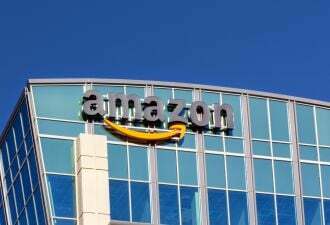 The company has been around for almost ten years, burned through more than $140 million and diluted almost all of the early investors to zero with very little to show by way of volume sales. Their press release page is a litany of hiring announcements and awards with nary a commercialization-related piece of news to be seen. They're not dead but if they had to do it over again, I imagine they'd chose a different path. There are scores of solar start-ups in this category. When the price of raw silicon spiked a few years ago because of demand outstripping supply, a herd of start-ups emerged with technical innovations for minimizing the amount of silicon used in the PV panels. Some of the methods were quite complex, requiring dicing of silicon wafers, and precision alignment and lensing to achieve a small concentration and halve the amount of silicon used. The business plan might have made a bit of sense when the price of silicon was at record highs. But when the price of silicon inevitably dropped because more supply was brought online, start-ups like Solaria must have been faced with some harsh reality checks regarding their business plan and competitive pricing models. Many concentrated solar firms fall into this category. Sunrgi, a CPV aspirant, burst on the scene a few years ago making unsubstantiated technical and commercial claims. They produced high quality artist-renderings and models of their products along with high production-value videos. They gave interviews, won awards from the uninformed but when their flimsy technical claims were investigated, they crumbled like a house of cards. You can read about it here. Optisolar: Optisolar raised more than $300 million based on a vision of the economies of scale of building a gigawatt-sized factory. (Read Michael Kanellos' Inside Optisolar's Grand Ambitions) The vision was that the cost of solar could be radically dropped by building "Solar City" factory complexes capable of churning out 2.1 gigawatts to 3.6 gigawatts of solar cells a year. These factories would cost $500 million to $600 million and be composed of factories-within-factories focused on different tasks: an onsite glass making outfit capable of cranking out 30 million square meters of glass a year; a solar cell unit with 100 identical manufacturing lines; and a full-fledged packaging facility. Optisolar was an audacious bet, smacked down by the grim realities of the economy, by mission-creep, and by the hubris of the founders and investors. SV Solar: SV Solar raised $10.2M from Bessemer to build low concentration PV technology and then quickly disappeared. Bessemer funded a low-concentration PV firm (strike one), with a staff that had very little solar experience (strike two), based on some amazing cutting edge technology that they called -- a prism (strike 3). The company’s value proposition was based on the high price of silicon at the time by investors who didn’t fully get the concept of supply and demand -- how the price of the silicon commodity was bound to drop as capacity was added. The next few years of solar start-up dynamics will be dramatic, sometimes wrenching, and occasionally triumphant. For detailed research on the winners and losers in c-Si - see Surviving the Solar Shakeout.